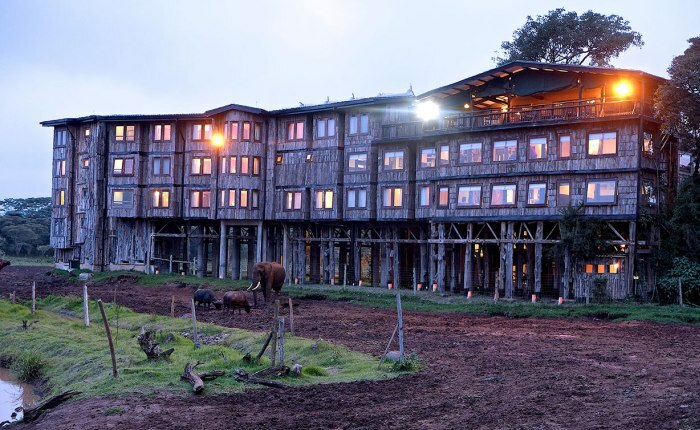 Tour Kenya in 5 -day,4- night with visit to the Aberdares and an overnight stay at a tree hotel / lodge, Lake Nakuru National park in the Rift valley & the ultimate Masai Mara game reserve. Tour accommodation is either optional economy, standard, luxury safari lodges or tented camps. Safari transport and game viewing drives are in a customized pop up top safari minivan..
• 1 day & night at Aberdare national park. • Lake Nakuru national park. • Awesome scenery including the great rift valley views along the safari route. • Blend of local cultures and tribes people including the Masai etc. • Elephant,Buffallo, Gazelle, dikdik, Giraffe, Lion, Ostrich, Cheetah, Warthog, Flamingoes, Pelicans etc. The drive is scenic via the central Kenya highlands with stops to view tea and coffee plantations. Transfer to your base hotel ( either the Aberdare country club or Outspan hotel). Proceed to the lake Nakuru national park. There shall be a stop to view the scenic Thompson falls at Nyahururu. The drive via farming country and local homesteads via the Great Rift Valley escarpment floor is scenic. Afternoon bird watching and game viewing drive. Enjoy the diverse ecology and varied habitats that range from the Lake itself to the surrounding areas. The lake is home to hundreds of thousands of flamingoes and other bird species. Lake Nakuru hosts in its sanctuary the black and white rhinos. Overnight at your lake Nakuru lodge or tented camp. What you may see at lake Nakuru national park ….. Flamingo, different terrestial bird species, unique vegetation of about 550 different plant species, Waterfalls, White Rhino, Black Rhino, waterbucks. Overnight at your Masai Mara safari lodge or tented camp. Today shall be a game viewing extravaganza! Masai Mara Game reserve remains the most exciting wildlife eco-system. It is host to the highest and most varied concentration of wild animals than any other wildlife park in the region. The scenic appeal of the tree studded savannah plains, the moderate climate and diversity of wild game species makes it a one stop shop for game viewing activities. We shall traverse the Masai Mara reserve on a full day of unlimited game viewing encountering the big five and more of the lesser game. A morning game viewing drive at the Masai mara. An extra game drive as you depart the reserve. Proceed to Nairobi. Arrive Nairobi in the late afternoon.